Written by David Milder of Danth, Inc. I argued in the White Paper, reflecting conventional wisdom among economic development experts, that the lack of jobs was seen as an important constraint on the ability of small rural communities to prosper and retain their populations, especially their Millennials. My recommendations were to try to improve the ability of residents to earn more money and to recruit new residents who would not need new jobs because they were retired and financially comfortable, could bring their jobs with them, or could create their own jobs. However, today, many rural counties, and probably the small towns within them, are sharing in the relatively low unemployment rates, under 5%, that are to be found across the nation. Do small towns in these counties then still need to enhance the earning power of their residents? Does my White Paper’s analysis on this point still stand or need revision? A major thrust of my argument in the White Paper was that smaller communities should not focus their economic development efforts on chasing after employers who might bring lots new jobs to the communities because they are hard to recruit and relatively few of their residents would get the jobs (most would go to outsiders). Instead, I strongly suggested that primary strategic focus should instead be placed on their resident “contingent entrepreneurs” who are in relatively insecure employment situations and might constitute 30% to 40% of their workforces. The strategic approach I suggested was in essence an attempt to retain and expand these micro businesses. However, the findings of a Bureau of Labor Statistics (BLS) report released in June of 2018 suggest that my estimate of “contingent entrepreneurs” was far too high. Again, does my White Paper’s analysis on this point still stand or need revision? Low county unemployment rates came to my attention as I was going over some data about a rural small town in WI. 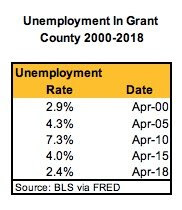 Looking at five distinct years of unemployment data for its county (Grant County, see table), except for the time around the Great Recession in 2010, its unemployment rate was 4.3% or lower, and its rate in April of 2018 was just 2.4%. That was even lower than its 2.9% rate back in 2000. Economists have generally accepted unemployment rates around 5% as normal (2). According to that benchmark, Grant County’s unemployment rates have usually been normal or even lower than normal. This question then arose: is Grant County an outlier or are rural counties in WI generally experiencing relatively low unemployment rates? Using a list of WI’s rural and urban counties, I looked at their unemployment rates in April of 2018 (see above table). Yes, the average 3.6% rate among the 46 rural counties is higher than the 3.3% average for all 72 counties and the average 2.7% rate for the 26 urban counties, but the really important point is that the rate for the rural counties was just 3.6%. Moreover, the median unemployment rate for the rural counties was 3.25%, which means that 50% of these counties had rates lower than 3.25%. Then the question for me became: Is the situation in Wisconsin an outlier? Given time and resource constraints, I decided to look at the counties in New York and South Dakota, two states quite different in character from WI and from each other. NY has an economy dominated by a huge metropolitan area around NYC. Its upstate manufacturing and agricultural industries (e.g., milk) were facing problems long before the advent of the Great Recession. The state also has many sizeable cities besides NYC such as Buffalo, Rochester, Syracuse, Albany, Schenectady, Utica, Troy and Binghamton. Many are doing poorly. For instance, Syracuse has the 13th highest poverty rate among cities in the US. South Dakota is more sparsely populated, less industrialized and more rural that NY or WI. The average unemployment rate for NY’s 27 rural counties, 5.9%, is higher than the average for all of the state’s counties, 4.6%, and for its urban counties, 3.6%. It also is 63% higher than the rate for WI’s rural counties. However, it is just 0.9% above the 5% benchmark for normalcy. The unemployment rate for SD’s rural counties was 4.2%, below the 5% benchmark and not that much above the 3.9% rate of the state’s urban districts. The results from these three states suggest that the lack of jobs is not currently a major economic problem for rural areas in many states. What, then, are the major economic problems in these counties? One is nominal population growth. As a recent study from the Pew Research Center stated: “…rural counties have made only minimal (population) gains since 2000 as the number of people leaving for urban or suburban areas has outpaced the number moving in.” Also, its survey found that rural residents were less likely to want to move to a new community and more likely to live near a family member.(3). Another can be seen by looking, again at Grant County. Although Pew found its population had grown about 1% between 2000 and 2016, a recent study by the National Low Income Housing Coalition reported that an hourly wage of about $13.25 is required in that county to afford renting a 2-bedroom apartment at a Fair Market Rate, while the estimated average hourly wage of renters is only about $9.68 (4). That means that 26.9% of the Fair Market Rent is unaffordable for the average renters. In turn, that underscores another important point that is part of the conventional wisdom among economic development experts: rural areas need more than just jobs, they need well-paying jobs, one that provide at least living wages. A factor that adds to the issue’s complexity is that that living wages are not defined just by market forces, but also by the characteristics of the households involved. The table below shows what a living wage would be for various types of households in Grant County (5). What also pops out from that table is just how much more income households with children require. It seems that rural residents are willing to cope with a high degree of financial stress to stay in a rural area and close to their families. For some, that stress or perhaps the fear of that stress, reaches the point where they decide to leave. Help contingent entrepreneurs to find more and better paying work opportunities or assignments in local and larger market areas and to then help prepare these workers to win and successfully complete them. Stimulate and enable local retailers to implement an omni-channel marketing strategy that can penetrate larger market areas. Stimulate entrepreneurs with no employees to not only increase their revenues, but also expand and hire workers. Help local residents identify remote work opportunities and, if they need it, to steer them to the types of training those job opportunities required. Create an attractive entrepreneurial environment that could attract more capable contingent entrepreneurs and small business operators who prefer living in small towns with high quality of life characteristics, but now reside in urban or suburban locations. STEEs can still usefully perform these needed functions even when local county unemployment rates are relatively low, both historically or compared to urban counties. Though more people may be employed, many of those with jobs may need and want help to find better paying employment. The strategy of recruiting firms that will bring lots of jobs to small rural towns does not mean either that a) substantial numbers of those jobs will go to local residents or b) that those jobs will be well-paying, as many small towns have learned from the Walmart and Amazon distribution centers that opened in them. Indeed, many of the firms that seek rural locations do so because they are looking for lower labor costs. So far, nationally, our resurgent economy has substantially reduced unemployment, but to date it has not significantly increased the incomes of many of our households, especially those with wage earners in non-supervisory positions or in rural areas. Until that does happen, STEEs can be of considerable value. It seems to me, then, that relatively low to normal unemployment rates in rural counties do not diminish the relevancy or the need for the kind of strategic approach I outlined in my White Paper. Also, in many states, such as WI, their rural economies are tied to both agriculture and manufacturing. Manufacturing, which tends to be cyclical, has been doing well in recent years. An eventual cyclical downturn or increased robotization may again increase rural unemployment, again worsening rural economic conditions. The Number of Contingent Entrepreneurs and Their Importance. In 2010, the Intuit 2020 Report stated that: “Today, roughly 25-30 percent of the U.S. workforce is contingent, and more than 80 percent of large corporations plan to substantially increase their use of a flexible workforce in coming years” (6). 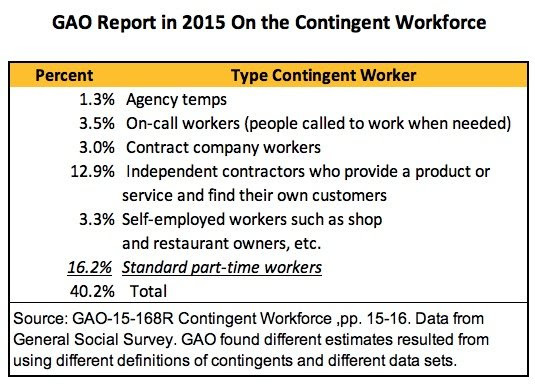 In 2015, the U.S. Government Accountability Office (GAO), responding to Sen. Kirsten Gillibrand, looked into the contingent workforce and its size, characteristics, earnings, and benefits. It found that: ”The size of the contingent workforce can range from less than 5 percent to more than a third of the total employed labor force, depending on widely-varying definitions of contingent work” (7). An article in Quartz in 2017 cited a 2014 survey done for the Freelancers Union that found that “there are 53 million people doing freelance work in the US – 34% of the national workforce” (8). 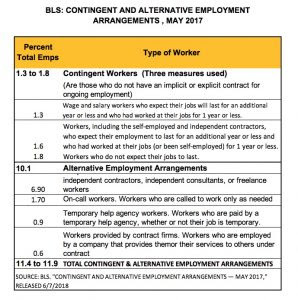 As can be seen in the above table, the recently published BLS study results indicate that those engaged in contingent and alternative employment arrangements only account for between 11.4% to 11.9% of our national workforce. The difference between 11% and 30% to 40% is obviously very significant numerically. But, is it significant analytically or from a strategic viewpoint? The arts work of many artists who need a fulltime non-arts job to support themselves and their families, but whose artistic activities constitute part-time jobs and what they want to do fulltime. Or the person who has a fulltime job as a professional planner, but part-time employment as a real estate developer. Or a fulltime university professor who also owns and manages 10 rental apartments. Workers whose fulltime jobs cannot cover their household’s financial needs and who also have one or more part-time jobs to fill the gap. Lastly, BLS excluded jobs associated with the gig economy e.g., those with Uber, Lyft, Taskrabbit, AirBNB, etc. from their survey. In my judgement the BLS estimates should be taken as a very solid minimum estimate of the contingent and alternative arrangements workforce, with the exact number being treated as not knowable at this point in time because of a lack of consensus about how the subject group should be defined. Moreover, I would argue that the minimal BLS numbers are sufficiently large to merit considerable strategic consideration – and that, not the “true” number of contingents, is the critical question. My White Paper needs to be amended to include these points and to somewhat deemphasize the estimates of 30% to 40%. Nevertheless, the critiques of the BLS’s definitions of contingent and alternative work arrangements that followed its recent report combined with the prior research findings produced by very reputable investigators strongly hint that their true number of these workers may well be as high as 30% or so. Many of them were indeed entrepreneurs, whether or not they were incorporated or working fulltime. They incurred considerable risk and had to compete for and win opportunities to earn money on a relatively recurrent basis. If an effective entrepreneurial environment (a STEE) could be built up around them, they might become more successful financially and able to compete in larger market areas. They might also create start-ups that would hire employees. My concern was about their retention and growth: how they could be retained in their communities and how they could earn higher incomes. Many of them are vulnerable, with low incomes, no benefits and unhappy with their uncertain contingent employment situations. 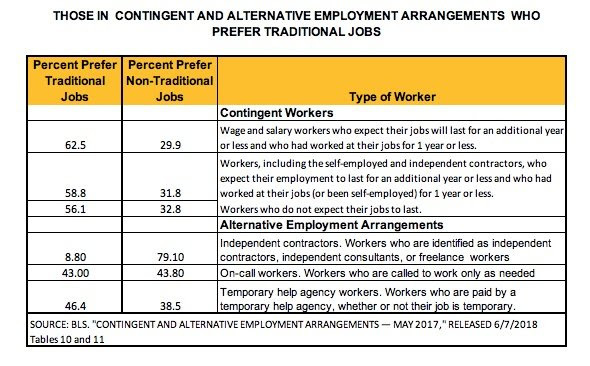 As the table below shows – using BLS data – they prefer traditional jobs. Lower unemployment rates may mean that more of these workers have found steady, more secure fulltime jobs, though their wages may not be at desired levels. The strong information brokerage and networking functions of an effective STEE would be likely to at least help some others to find fulltime and possibly better paying jobs. Some of those jobs might be remote ones. Are there contingent entrepreneurs to warrant a program to develop a STEE in this community’s downtown? Are there enough of them to use in marketing program to recruit more contingent entrepreneurs to live and work in this community? To help answer the first question, let’s also consider the fact, mentioned in my White Paper, that relatively large firms moving into this community are most likely to average about 50 new job opportunities and the vast majority of them will not go to local residents. 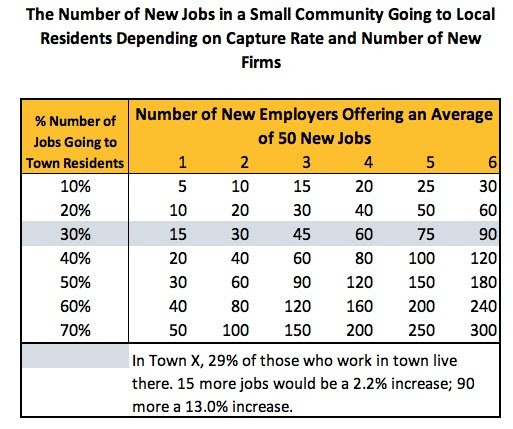 The table below shows how many residents of Town X would get jobs at various capture rates. Which is more likely to serve the needs of Town X’s residents a) a program to help its contingent entrepreneurs become more successful or b) a recruitment program aimed at bringing in more employers who can provide on average 50 jobs? 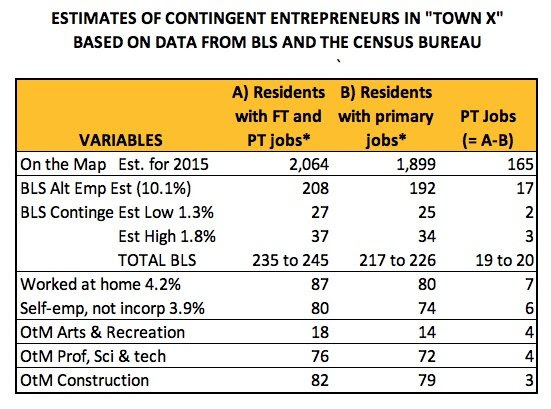 Extrapolating from the BLS data, in the above table on Town X, I conservatively estimate that its contingent entrepreneurs number between 235 to 245 of its residents. Using On-the -Map and other data from the Census Bureau, the table presents an estimate of 80 people with fulltime jobs who work at home and 74 residents who are fulltime self-employed but not incorporated. About seven of those working at home may have remote jobs. Most of these folks are likely to quickly learn about a STEE creation program. How many would then use it now cannot be estimated. Nor can how many will benefit from it. However, activities such as social networking events at local bars or restaurants and distributing information about online freelancer job marts and remote job marts can be done with relative ease and at relatively low-cost. Possible new jobs for residents, with their number being uncertain and may be zero. The odds of a small town recruiting such a job-rich company are relatively low. The cost of an effective program is likely to be significant and its successes, if any, will probably take a good deal of time to achieve. Local residents are unlikely to either know or “feel” the recruitment program unless firms are attracted, and new jobs are offered. In Town X, according to On the Map data, 29% of those who work in that town also live there. If it attracts one firm that brings 50 new jobs, about 15 town residents probably will get them. For more residents to benefit more firms with jobs must be recruited. If three firms were recruited – quite an achievement for a small town -- then about 45 residents might benefit. A significant probability that the jobs offered will not be well-paying. The town may have to offer incentives to the new firm(s) in the form of tax reductions, cheap land or infrastructure improvements that adversely impact on municipal finances. Possible traffic and environmental problems. There is no certainty of success for either of these programs. Local leaders will have to decide and take a chance based on “the best available information. However, one might argue that communities such as Town X should first try the STEE program because it has the potential for benefiting many more residents and then, if that program fails to meet its goals, to switch to a program aimed at helping the existing employers in town to grow. If local employers are few and/or weak, then the recruitment of outside companies that bring in some more jobs for residents may make sense. The 80 people in Town X who work at home are enough to help develop a quality of life recruitment program aimed at skilled people who will either bring their jobs with them or create their jobs or create new companies that will have employees. There are enough to populate meeting places and events so that a STEE would have a real tangible presence. Their public endorsements of the quality of life in Town X as well as the benefits of the STEE can be strong marketing tools. Their meetings with prospects and becoming “buddies” with those newly arrived also can be very powerful recruitment tools. I think that is point, game set and match. 3) Kim Parker, Juliana Horowitz, Anna Brown, Richard Fry, D’Vera Cohn and Ruth Igielnik. “What Unites and Divides Urban, Suburban and Rural Communities.” Pew Research Center. May 22, 2018. http://www.pewsocialtrends.org/2018/05/22/what-unites-and-divides-urban-suburban-and-rural-communities/ pp 89, p.1 and 59. For more information about DCI's services for smaller communities, visit our Services pages.